The year is half over and we’ve mostly seen all that year has to offer as far as smartphones go. Except, of course, for Apple new iPhones and Samsung’s last hurrah for the year. We already took a look at the premium phones that landed in the market in the first few months of the year and was admittedly at a loss for which one came out at the top. This quarter has its own roster with seemingly interesting personalities. Will a winner finally stand out? Let’s take a look. OnePlus kicked got the ball rolling with the, what else, OnePlus 6. By then, everything good and bad about the smartphone was pretty much known already. Top of the line specs, Full (not Quad) HD+ 18:9 screen, no wireless charging, flagship killer price, 3.5 mm headphone jack, and, of course, the notch. Like any other OnePlus launch, this one hit a bit of a snag but, like any other OnePlus launch, the company is moving quickly to make things right. HTC followed not long after with what is perhaps its one and only flagship for the year, the HTC U12+ (don’t ask where the HTC U12 went). Notch haters will be relieved that, contrary to earlier leaks, there is no notch here. The leaks were right about the dual front cameras, though, which is probably its most unique feature. Unless you are able to grab your hands on a semi-translucent back model. HTC has also stepped up its game with Edge Sense 2, which hopefully will find its way to the next Google Pixel. LG has had a very confusing 8 or so months. No sooner than it had launched the LG V30 last year did it follow it up with the LG V30S ThinQ. And then while the LG G7 ThinQ was still hot off the press, it came out with the LG V35 ThinQ. It’s almost too easy to call it a “G7 ThinQ without the notch”, but it might be a bit hard to justify the price tag, even with more RAM and more battery. 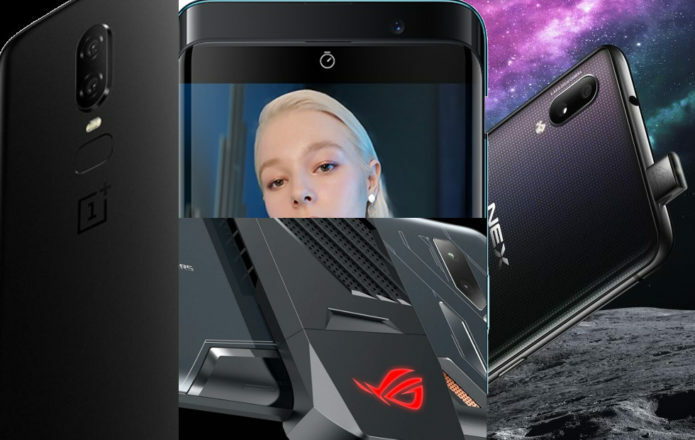 The surprise newcomer is, however, the ASUS ROG Phone. Perhaps thegaming phone, ASUS’ Republic of Gamers brand spared no expense not just on the phone and its crazy LED lighting but also on the accessories that position the ASUS ROG as the Nintendo Switch of phones. The only question now is how much ASUS will be charging for the entire experience. BlackBerry isn’t done yet with QWERTY phones, as proven by the KEY2. It takes everything that was successful with the KEYone, if there were any, and raises the bar. It finally makes good use of those 30+ keys, letting users assign apps and shortcuts to each and every one of them, from any screen and at any time. It’s also BlackBerry’s first dual camera phone and it will be interesting to see how it fares in the real world. And then we have the phones that you may never be able to have unless you’re in China or one of a few select markets. The Vivo NEX takes an interesting approach to solving the problem of the notch with an elevating front camera. The OPPO Find X, on the other hand, almost takes that to a ridiculous degree with an entire sliding back. Which approach will win more sales? We’ll have to wait a bit to find out. It’s also still far too early to make a conclusive recommendation, given we’re still waiting for quite a few smartphones in the next 3 months. First to come will be the Samsung Galaxy Note 9, which, like the Galaxy S9, shouldn’t be much of a departure from the company’s tried and tested formula. There’s also word of an Xperia XZ3 coming around IFA in September, which sounds like the Xperia XZ2 on a diet. And, of course, Google and Apple will also be butting heads. Google Pixel 3 XL rumors are giving mixed signals, not all of which are winning it favors. And for iOS users, there’s really not much choice aside from the three iPhone X look-alikes (only one is the real iPhone X 2). If we were to choose from these phones now, however, the choice is clearer. For an all-around Android phone that will be worth every penny, the OnePlus 6still lives up to its flagship killer reputation. If, however, you’re out for a phone that will stand out in whatever situation, then it might be worth waiting a bit for the ASUS ROG Phone to become available. Against these heavy hitters, it might seem that HTC and LG will have another disappointing year yet again.